Writing about Session: 10 Historical-Grammatical Interpretation, Andrew Lee shares his thoughts on the historical-grammatical method of biblical interpretation. Understanding the true meaning that the authors of the Bible intended doesn't seem too hard, right? I always thought that you just take your time and be intentional about comprehending it and keeping it in context. Well, after the most recent session of the theology program, I learned that it takes much more care to keeping context than I ever imagined. The session covered the history of Biblical interpretation, principals of proper interpretation, and common fallacies and mistakes that people make while interpreting the Bible. In hind-sight, this is all vitally important information for any Christian who studies the Word and I wish I would have known years ago. In the section about the history of interpretation we learned about the medieval church, before the protestant reformation. It blew me away that regular Christians were actually forbidden from owning a copy of the scriptures. The church leadership feared heresies starting due to uneducated people interpreting scriptures on their own. Well, this ended up causing tradition to not only be the rule of faith, but actually a source of revelation not found in the Bible; a serious heresy in itself. However, once the printing press was created it was not possible to prevent the truth from going out, and in to the hearts of the people. The church started studying the word in the original languages, and compared it to the institutionalized church's teaching. To no one's surprise, there were inconsistencies. What I learned through this is that you must understand, in the words of the author, what is being said or you may be seriously mislead. We cannot understand the author only from a modern perspective, or in light of what the church teaches today. We must find the exact point and purpose of the original author (or, as the course content puts it, the original historical, grammatical, and literary context). Anything else twists and tweaks the true meaning. Now when I read the Bible I take more care. I take a look at the historical context, who the author was, who he was writing to, what the purpose of his letter was, and what was going on at the time and many other things, in order to filter my understanding of the passage through it. This lets me understand what he was trying to say, not what my 21st century American mind hears. Then I pull out the idea that permeates all time and situations. Then I apply that never changing (or timeless) principal in to my life today. For example, in Proverbs 31, a popular passage concerning wives, the author says many things that are out of our cultural context, such as "She seeks wool and flax and works with willing hands." (v. 13) and "She is not afraid of snow for her household for all her household are clothed in scarlet." (v. 21). Does this mean that if a woman is married and doesn't look for wool and flax and doesn't have her entire family wearing all red everyday that she's not a good wife? Of course not. The timeless principle here is that she seeks the good stuff for those she takes care of and is always willing to do the various work that she does. Then, with this timeless principle, you apply it our life. This probably looks similar to a wife ensuring that her family has weather appropriate clothing, has the necessary things to ensure this (and other necessary things) will not go away in the future, and is always willing to do this (among other things) well. Not too hard, so don't be discouraged. As simple as this sounds to do, one would be surprised at how often Christians utterly fail to properly interpret the Bible. This week's lesson gave a very good list of the mistakes Christians have made and continue to make along with a good explanation of them. One that really stood out to me is called the incidental fallacy. The incidental fallacy is committed when one reads incidental historical texts as prescriptive rather than descriptive. Prescriptive information is that which is to be applied to our lives and descriptive information is that which describes an event, but does not necessarily encourage us to do it. A good example of this are New Testament events in which people speak in tongues when the holy spirit enters them after being saved (Acts 10:34-48 as one example). There are many today who believe that once you are saved you will speak in tongues, and if you do not speak in tongues, then the Holy Spirit is not in you, thus you are not saved. They consider historical information given, that is never commanded (we are actually warned to be cautious about speaking in tongues by Paul in 1st Corinthians), to be a prescribed necessity for salvation. Seeing as we believe in salvation through faith alone at Lakeside, we must be especially careful of false prescriptions in order to protect the gospel we share with our community. After this class I have learned there is more to interpreting the Bible than simply taking it at face value and that you cannot try too hard to find meaning that is out of context. Moreover, I've learned how to do this, which gives me confidence to read the Word without fear of getting it wrong, the same fear that medieval church leaders had of the laity, and that resulted in blatant disregard of the Word. 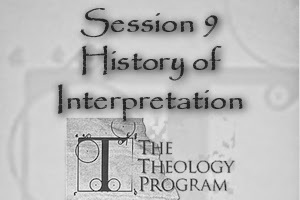 Writing about Session: 9 History of Interpretation, Evan O'Leary shares his thoughts on the history of biblical interpretation. 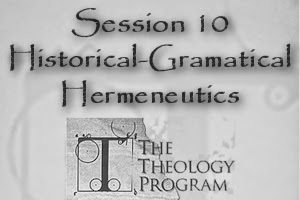 Session number nine in our theological study has brought us to history of interpretation, hermeneutics through the centuries. We first looked at four different questions regarding interpretation. The first question was, how did the first century Jews interpret the scriptures? Second was how did the Christ and the Apostles interpret the scriptures? Third was how did the early church interpret the scriptures? And lastly should Christians today follow the same hermeneutic as the early church? To better understand where to begin with our own understanding of interpretation, we started with introduction to hermeneutics. We looked at the three terms interpretation, hermeneutics, and exegesis. From these we can put together a historical-grammatical hermeneutic, which is taking the authors original intent to the original audience and finding the principles and truths that can transfer and apply to our lives today. Truths that when applied, change how we think and live our lives as Christians. When we do this we then can see that there is nothing written directly to us in the Bible, just the timeless truths we can find and apply. We must take the exegesis: the original meaning of the biblical text. Then with interpretation: the process of understanding, move to a biblical hermeneutic. After we looked at the correct way to study the Bible by using the historical-grammatical hermeneutic, we took a look at the history of interpretation through the ages. Ancient Jewish Hermeneutics, New Testament Hermeneutics, Patristic/Early Church Hermeneutics, Medieval Hermeneutics, and Reformation Hermeneutics. The ancient Jews when trying to make the word relevant to their current context often took an overly literal and legalistic approach. Using the scriptures in an out of context meaning for their current situation, and not just reading the scriptures but also reading the hidden message behind the scriptures. If you simply just read the Bible for what it was saying then you were uneducated and 'missing' the hidden deeper meaning in the text. The Palestinian Jews used the Midrash method of interpretation. It sought to con-temporize the text of the scripture so as to make it relevant for everyday application. What they don't say in that explanation is that most of that method came from extensive out if context teachings. Abusive characteristics that included, giving meaning to texts, phrases, and words without regard to the context in which they were meant to apply. Combining texts that contain similar words or phrases even if they weren't referring to the same idea. They became "experts" in the Law and yet Christ called them hypocrites. As we moved through history we found that over time there arose different views of interpretation. A hermeneutic battle of sorts broke out between two schools. The school of Antioch took the literal approach, and the school in Alexandria took the allegorical approach. The school in Antioch thought that allegory or finding the deeper meanings that lay behind the literal sense was a foolish approach. The Antiochene school of interpretation or historical-grammatical approach, did not gain wide acceptance until the reformation. So what does all this mean for us as Christians today? Are we using a biblical hermeneutic in our own bible studies? Do we read the bible for what it says or for what we want it to say or even for what others have told us it means? We need to take the right approach with biblical interpretation and be careful to not be like the Pharisees. We must not mistake the Bible for what it is truly saying, so that we can correctly take the many truths of the Bible and make them ever applicable to our everyday lives. Then we can apply them and see the wonderful changes God can make in our lives as Christians. 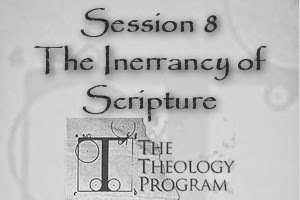 Writing about Session: 8 The Inerrancy of Scripture, Nathan Smock shares his thoughts about how the Bible is true. It’s a little ironic how the post modern mindset of unknowable truth is at such odds with the assertion of the inerrancy of scripture. One would think the pessimism and despair, so equated with the post modern, would rather drive them to a desire to embrace the truth of inerrancy with a fervency that would cause envy in the hearts of mature Christians. But such is the depravity of sin. Similarly, within much of the church, it seems the necessity for inerrancy no longer exists. With the pervasive acceptance of relativism, ultimate truth is no longer the goal, but blind universalism. If the topic of inerrancy is broached it is nervously dismissed as yet another unknowable individualized option to the increasingly vague idea of salvation and the works required to obtain it. Grudem will go on to point out this definition does not mean the Bible holds all facts on every subject, but simply what it does say is true. In the light of this definition, we are forced to acknowledge that our opinions and our feelings do not matter, as that which is fact is inseparably tied to that which is reality. Reality is a universal state of existence not dependent upon the individual interpretation of events or data. This is particularly vexing to the post modern who would prefer license to either accept or reject truth as they see fit. Never mind for the moment the very self defeating logic upon which the rejection of inerrancy stands (remember, inerrancy is the claim of ultimate truth and to the post modernist that’s not allowed), but for those adherents willing to reject Biblical truth on fundamental topics, such as God’s created universe and therefore His corresponding laws, you don’t often see post modernist rejecting physics by jumping off a cliff in their pursuit to fly. As I close, it should be noted, while the inerrancy of scripture is attested to within the scripture itself, and the failure of that inerrancy would ultimately lead to the demise of scriptural reliability, it is by the grace of God that initial adherence to the concept is not only unnecessary but impossible without the presence of the Holy Spirit for salvation. Moving forward, one need not abandon the intellect that was given by God as a means to draw us to Him. Rather to be embraced, allow it to drive us deeper into the truth found in scripture. As God’s reality becomes more apparent through diligent study and trial, we will be equipped all the more that we might perform the good works He has laid out for us in advance. Writing about Session: 8 The Inerrancy of Scripture, Beth Warrick shares her thoughts about how the Bible is true. Is the Bible perfect? Are there errors in the Bible? Believing that the Bible is “inerrant” is to believe that the original manuscripts of the Bible (autographa) were, in fact, without error. The Bible that we have today does contain errors (variants) due to errors in copying and translating the manuscripts over time. However, none of these errors affect any major doctrine of the Bible, and almost all of them make no theological difference and can be explained through a process called “textual criticism.” Most the errors are things like a missing “0” in a number, or a reversal of words, like “Jesus Christ” to “Christ Jesus.” Other things in the Bible seem to contradict itself, until you study it and understand the purpose and audience to which it was written. Why does it matter if the Bible is inerrant or not? It has to do with where we place our authority, and how strongly we can place our trust in that authority. Ultimately, for me, if the Bible is God’s Word to us, then it must be perfect in what God intends to accomplish through it. God is holy, perfect, and sovereign, so He would not allow something that was not true or useful to exist in the Bible. However, not all Christians believe that the Bible is inerrant. Believing in the inerrancy of Scripture is not essential to salvation because Christianity is based on the fact that Christ rose from the dead after paying the price for our sins through His death on the cross, not whether the Bible is perfect. In my own life, I haven’t always felt strongly about the Bible being my authority. I didn’t study it, trust it, or follow it as I should have; I did more of what I wanted to do and let other things be my authority, such as my own feelings, other humans, what was popular, what society accepted and encouraged, etc. I am so thankful that my Heavenly Father has shown me that He must be my Authority and that I should test all things against what His Word, the Bible, says, and the more I know His Word and follow it, the better off I am and the more He is glorified. 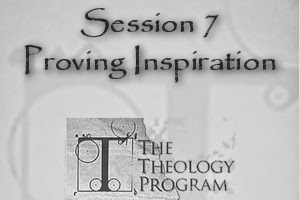 Writing about Session: 7 Proving Inspiration, Candice Smock shares her thoughts on proving inspiration of Scripture. So the Bible was written by God 100% and by man 100%? All of the books of the Bible were inspired by God? A complete and perfect message from God in the exact way He wants us to know it? Prove it! The Bible has had to jump through many hoops of criticism over the years to get where it is today- bound together in one piece on our bookshelves. Who wrote it, is it true, can we trust it, is it the same as the original, what does it mean, is it complete, is it perfect, was something left out? Uh, I didn’t even know to ask these questions, let alone have the answers to them. As explained in the two previous blog posts, inspiration is defined as God, by various means, directing the writers in the content of His message while employing their personalities and knowledge in the way that content is communicated in the writings. But how can we be certain of that? Haven’t we seen other religions make similar claims? What evidence do we have for a God inspired book? Scripture self-attests to being inspired in many different places and ways, exactly what you would expect from a book that has ultimate authority from God. You could hardly trust something to be authoritative if it claimed itself to be insignificant. The Bible is exceptionally unique in it’s coverage of topics, people, places, inclusion of authors in different places, and languages written over a period of 1,500 years! This may not seem a big deal, but considering the unlikely consistency with the inclusion of so many hands and the unequaled popularity over thousands of years one, at the very least, has to admit that it is indeed unique! There is significant historical evidence internally (i.e. Events and claims made within the writings) and externally (i.e. Archeology and attestation from other historical documents). What other book foretells the future in detail, in several instances, from days to thousands of years, while challenging you to test the authority of the message? None! A self-fulfilling prophesy if you will. Jesus Christ himself fulfills prophesy through events of His entire life, from birth (who can control where they are born? ), all the way through His death, burial, and resurrection! Not to mention He also validated Scripture as being from God and true with His dialogue but also in His gift of authority to the apostles for the New Testament to be written (and in some cases, exact words to be written). The Bible exhibits the characteristics of wisdom, discernment, and divine conviction. Enough to change the life of the reader and for others to notice. And not one life, but millions. The kind of conviction every human expects to have from the one true God. What’s the secret to unleashing this ability? Next. The Holy Spirit. When God baptizes you in the Spirit, the Spirit testifies to your heart, mind, and soul that the message is true. You want it? You gotta ask for it. But I have to warn you, God might break you before you genuinely desire it. And once you do, nothing else will suffice. But what do I know personally? Not much. I can’t read the Bible in Koine Greek, I can’t tell you who wrote Hebrews, I don’t know what else that guy burned when he was in possession of the Dead Sea Scrolls. But what I do know is #7. In May of 2013, God broke me. On June 6, 2013, He baptized me with the Holy Spirit. #6, this last year He has changed my life and my husband’s life through His wisdom, discernment, and conviction of the divinely inspired Word. #5, Jesus’ testimony proves Scripture to be accepted by God, but more amazingly proves that we are accepted by God. #4, like the foretold prophesies, we can depend on fulfillment of His plans for us. #3, these evidences are something to hold dear when I am feeling weak and may strengthen the weaknesses of others. #2, this point is making me fall in love with Bible, which shows me how from the very beginning everything points to Jesus. And #1, the Bible claims to be God’s very words. And He tells us to read it, to put it on our hearts, wear it on our bodies, and adorn our houses with it (Deut. 6)! Will you be one to say no? 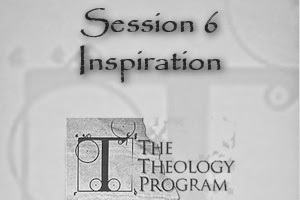 Writing about Session: 6 Inspiration, Larry Meiners shares his thoughts on the inspiration of Scripture. What does it mean that the Bible is inspired? How did inspiration occur? How does one’s view of inspiration affect their interpretation? These are all good questions about how scripture was written. That is one of many reasons why I decided to take the Theology class. To answer questions like these about the Bible and the information it contains. What is inspiration? The best biblical definition is: The act whereby God guided the writers of Scripture, giving them His words while fully utilizing the human element within man to produce the Scriptures. Making the Bible a product that is 100% God and 100% man. There are many places in the Bible that clearly tell us that the Scriptures where inspired by God. In 2 Timothy 3:16 -17, Paul writes, that God inspired all Scripture for teaching, reproof, correction, and training in righteousness so that man may be adequately equipped for every good work. To further support that in 2 Peter 1:20-21, Peter tells us that no prophecy of Scripture is that of one’s own interpretation and that all the men where moved by the Holy Spirit spoken from God. Many times we will hear someone say that they were inspired by God to do something. Are they truly inspired by God? Did God guide them in what they did? Or did God simply illuminate them? My opinion of most of these accounts is they are probably illuminated by God not inspired. Illumination means the act whereby God enlightens us to understand His revelations and its relevance to our lives. So for me to say that God has inspired me to take the theology class here at Lakeside is probably not a correct statement. I should say that through the graces of God, He is illuminating me by taking this class to help me understand His revelation and its relevance to my life. There are several different theories of inspiration. Just to name a few, Natural inspiration is the belief that certain people were extremely gifted through their natural God-given abilities to write Scripture, Mechanical Dictation inspiration is the belief that God simply used the hand of man to passively write His words, and Verbal Plenary inspiration is that all Scripture is inspired by God who utilized the human element within man to accomplish this without error. As you read the bible you could say that there are these three forms of inspiration in the writings of the Bible. You can also see that God has a part in all of these. The one that is truly correct is Verbal Plenary. It is important to know that Scripture is the only thing that is said to be God-breathed. Although the Bible is inspired by God, there are many examples of human element within Scripture. Some examples are the emotions in Psalms and Romans 9, Grammatical Differences in Hebrews and John, Grammatical errors in Romans 5, phenomenological language in Joshua 10:13, and the use of round numbers. There are other things too that are of human nature that you will find though out the books of the Bible. One thing I took away from this lesson was although Scripture is written 100% by man, it was inspired 100% by God in some form. Whether it is God speaking directly to the person writing, the Holy Spirit directing, or by Jesus coming to the earth and dying for our sins the Bible is truly Gods Word. Writing about Session: 6 Inspiration, Gary Presnall shares his thoughts on the inspiration of Scripture. The lesson for session 6 of my theology class I am taking was Inspiration of scripture. The key points that had an impact on me in the lesson were that there is only one interpretation of scripture, but many applications. I was always under the impression there were many interpretations and many applications. I appreciated how God reveals Himself to us in different ways, and knowing how He does that. The ways He does that is by illumination, inspiration, and revelation. Illumination meaning God has to step in and help enlighten people and help them understand why His Word is true, relevant, and active working in people’s lives. It’s also objective in nature. Inspiration is God guiding people to write Scripture and giving them the words to write without bypassing who and what they were, fully utilizing their personalities and experiences. In the Old Testament they were called Prophets. Revelation is where God reveals His Truth to us through Scripture and through nature and our conscience. There are many theories on how Scripture was inspired. I guess what stuck out are the more disturbing theories. One is the Degree Theory of Inspiration. It is a belief that some of the parts of the Bible are more inspired than other parts, thus we get half truths. In my opinion, it’s either all true or none of it is true; it’s one or the other. The other theory that’s disturbing is the Mechanical Theory. The definition is God used the hand of man to passively write His Word. Its 100% God and man had no part. Its treated here as a magic book, that the prophets were like puppets. It is taught by Muslims the Koran was written this way as well as the Mormons believing their book of Mormon was dictated. This was a great lesson. I totally believe in the theory of Verbal Plenary Inspiration and that all of Scripture is inspired by God. 100% God and 100% man, written down by man without error.